If your idea of bling is something small, beautifully-formed and dazzling. This is it. 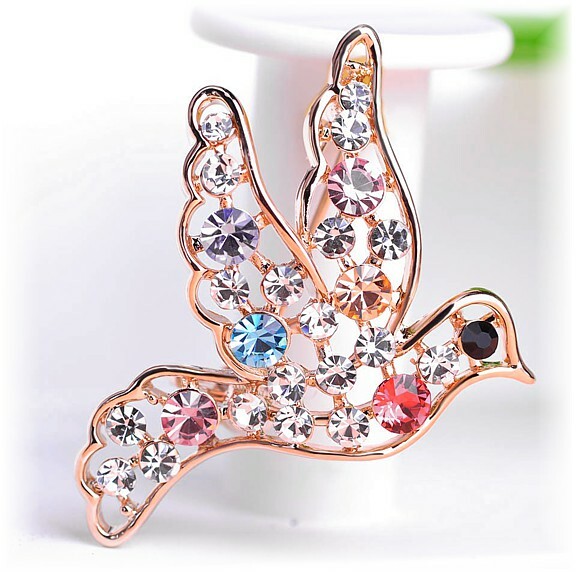 A little Dove of Peace that you can wear just about anywhere from lapel and pocket to hat and a glove. Small in stature, but big on dazzle factor, this enchanting little bird is the perfect gift from a child and a brilliant stocking filler. The setting is rose-gold plating and the shimmering stones are Austrian crystals in shades of pink, turquoise, pale topaz, jet and crystal clear. Size: 4cm (1¾”) x 3cm (1¼”).